Every event is customized down to the smallest detail according to Moncucchetto’s philosophy: banquets, business dinners, theme nights and more are tailor made in an ideal location for conversation, aiming to combine pleasure and elegance. Immerse yourself in a unique and memorable event, in a charming and relaxed setting, while delighting in an exclusive and tantalizing culinary experience. For business or leisure, this magical environment ensures the gathering is a tailored fit designed specifically to guarantee guests maximum satisfaction with maximum flexibility. A quality event for all occasions, from business lunches to wedding feasts, in which the art of the location is reflected in the art of the cuisine. 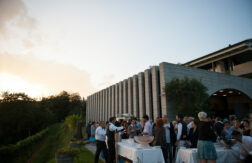 With its characteristic atmosphere, the dining room seats up to 70 people or up to 100 guests for standing dinners, gathered between the views of the vineyards and the open kitchen. A private room is available for up to 12 people. During pleasant weather, enjoy the outdoor terrace or the space under the arch, the symbol of this Mario Botta construction. Open all year, Moncucchetto is the first private Swiss club of the Chaîne des Rôtisseurs, the oldest gastronomic association in the world.